The Democratic Congressional Campaign Committee has launched two TV commercials attacking Republican candidates in the 39th Congressional District. Presumably, the DCCC is concerned that no Democrat will make the top two in CD-39. The DCCC ad hitting Orange County Supervisor Shawn Nelson (R-Fullerton) attacks his pension and vehicle. The DCCC ad hitting former Senate Republican Leader Bob Huff (R-Diamond Bar) attacks him for votes on sales taxes, income taxes, vehicle license fees, and port containers. 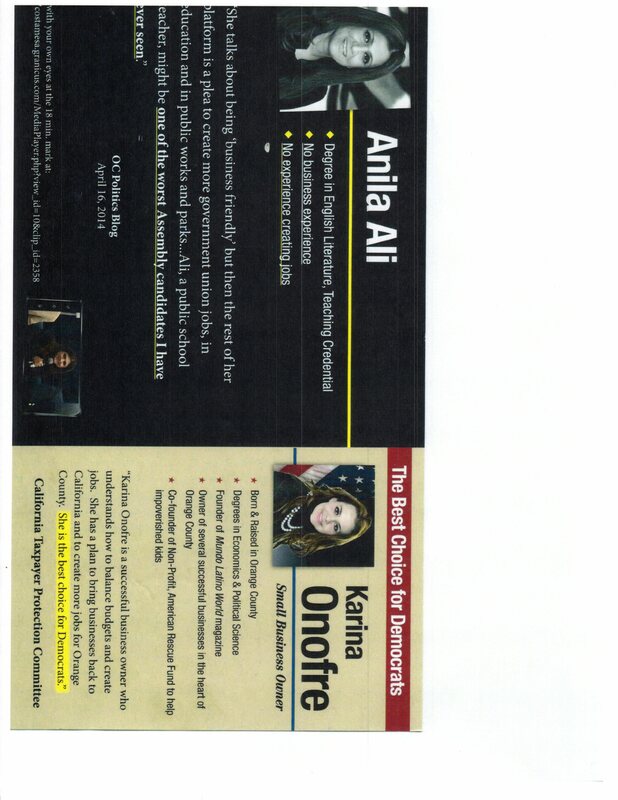 OC Political is not aware of a DCCC ad hitting former Assemblywoman Young Kim (R-Fullerton). While those who follow Congressional politics know that DCCC is the official campaign vehicle of House Democrats, the average voter is probably not aware of who they are. Additionally, D-Triple-C is the usual pronunciation of the committee name, but the ad refers to the committee as the D-C-C-C. (The “About Us” page of the DCCC’s official web site even has a giant heading labelled “D-Triple-C” on it.) A casual viewer will not necessarily make the association with the House Democrats. The DCCC disclaimer is perfectly legal, but they mask its association with the Democrats as much as possible since the target audience of these ads are Republicans, especially considering the anti-tax angle with the Huff ad. Interestingly, the DCCC publishes opposition research files online. Presumably, this is to make it easy for independent expenditures to fire at candidates without having to reinvent the wheel by researching information that the DCCC already found. Also presumably, the complete files are not published, as it would seem reasonable the DCCC wouldn’t want to reveal its entire hand. The DCCC’s Nelson file is 18 pages long. The DCCC’s Huff file is 38 pages long. The DCCC’s Kim file is a whopping 208 pages long. While the content for the “Can’t Afford Nelson” TV ad is drawn from the DCCC’s Nelson file, the content for the “Huff Puff” ad is not drawn from the DCCC’s Huff file, but rather from the Enough Huff web site set up by Howard Ahmanson. Specifically, the anti-Nelson ad uses an Orange County Register quote of Senator Pat Bates (R-Laguna Niguel) regarding Nelson’s pension, a Register editorial on his pension (twice), and a Register article on his vehicle and car allowance. The anti-Huff ad uses a San Gabriel Valley Tribune article quoted at the bottom of Enough Huff’s tax page. The anti-Huff ad also digs up Huff’s vote on SB 974 from 2008 and the CalChamber’s job killer bill list. “Doublespeak…disturbing…shocking…” That’s what Supervisor Shawn Nelson’s Republican colleague said about his pension hypocrisy. Nelson promised to cut pensions, then signed up for the most lucrative pension available that ultimately cost taxpayers a quarter-million dollars, and Shawn Nelson drove a taxpayer-funded $44,000 Prius on top of a $9,000 a year car allowance. The OC Register said that “Nelson…disappoints…on pensions…” Shawn Nelson for Congress? We can’t afford it. DCCC is responsible for the content of this advertising. Sacramento Politician Bob Huff huffs and puffs about lower taxes, but did you know Huff supported billions in higher sales taxes, higher income taxes, and higher vehicle license fees? Bob Huff even voted to tax every container shipped through major California ports. The Chamber of Commerce called it a “job killer” bill that would hurt our local economy. Bob Huff: he huffs, and he puffs but will make your taxes go up. DCCC is responsible for the content of this advertising.